What does the Group of Seven and maple-inspired cuisine have in common? They can both be found at a Lanark County fine dining restaurant, The Stone Cellar, where the chef and owners have found a way to celebrate Canada in a unique – and flavourful – way! Guests will find The Stone Cellar is a place where they can “awaken their senses” in a culinary adventure. This fine dining restaurant was an Open Table Diner’s Choice in both 2015 and 2016, and in 2017 was listed as one of Open Table’s 150 Best Neighbourhood Gems in Canada, one of only six restaurants in the Ottawa area. Located in downtown heritage Perth, guests to The Stone Cellar can experience a seven-course Group of Seven or a five-course Maple Flavours menu, that will remind them why being Canadian is an amazing thing. There’s very little more quintessentially Canadian than the artworks created by the famous landscape painters, the Group of Seven. At The Stone Cellar, they have incorporated these true-Canadian artworks into a delectable dining experience, the only Group of Seven representation of its kind in the province. It’s edible art! The first question people ask when they hear of Group of Seven menu is how can you incorporate art into food? Sounds impossible, doesn’t it? When you’re Chef Jamie Troutman, working alongside Chef Nick Valliquette from The Stone Cellar, achieving the impossible becomes possible; in 2016 Valliquette competed on the renowned Chopped Canada television show, and won! Chef Troutman developed The Group of Seven menu by selecting elements from the seven artists’ paintings and integrating them into the meal. The connection with the Group of Seven can be either visual, or a literal representation found in menu items, and as a bonus, the meal is 100 per cent Canadian! 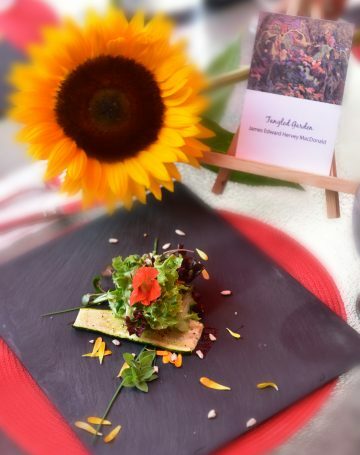 This seven-course meal could include a pairing with Iceberg vodka, a Canadian company that is a literal representation of the icebergs featured in Lawren Harris’ famous Iceberg painting, or take a more visual approach, and include a sunflower salad, mimicking J.E.H. MacDonald’s Sunflowers Thornhill. Other courses could include PEI mussels in a Riesling butter broth, pork with maple glaze, a play on a lobster BLT, or local cheeses with birch syrup. Another option for The Stone Cellar guests is a five-course Maple Flavours menu, where the sweetness of Lanark County maple syrup can be found in every dish. And with Lanark County being the Maple Syrup Capital of Ontario, this meal is found in the right place! The Maple Flavours five-course menu is paired with Canadian wine and spirits and could include menu items like Granny’s apple and butternut squash soup with a Lanark maple kiss, salmon tartar with maple cream, Ontario maple pork, a Balderson cheese pouch with maple-lime honey, and a double-chocolate brownie with maple bacon ice cream – seriously devine. The Group of Seven and Maple Flavours menus are available upon request (with a minimum of 48-hours notice), and with only one condition – that everyone at the table joins in the fun. With menu descriptions like these that shouldn’t be a problem! Contact The Stone Cellar to delve into these truly Canadian offerings.